Alvati is a Konkani rainy season delicacy. It is a delicious curry prepared from tender colocasia leaves. Gooseberry curry with sour curds/sour buttermilk and a flavourful garlic seasoning. Comfort food at its best! Batate humman is a Konkani favourite. It is a spicy, coconut based curry with potatoes in it and is flavoured with asafoetida and coconut oil. 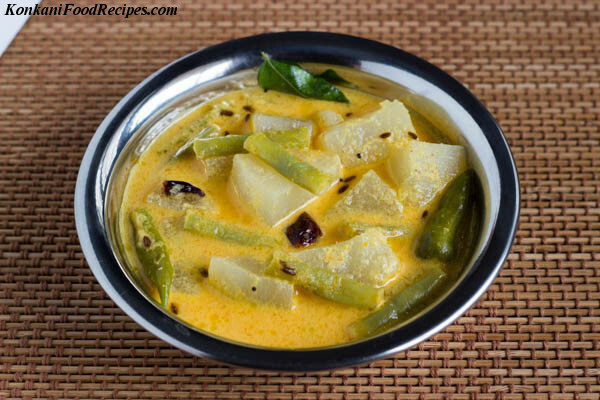 Recipe to make a delicious bamboo shoot curry, called as kirla randayi in Konkani. Bamboo shoots are a Konkani cuisine favourite. Majjige huli is a tangy, spicy curry prepared with veggies, coconut and yoghurt, with a very flavourful seasoning!! Raw jackfruit curry called as kadge randayi/kadge gashi in konkani and is a very popular konkani dish. Kadgi ghashi is raw jackfruit in a spicy coconut curry. Kuvale puli or puli koddel is a Konkani delicacy. A coconut based curry that is sweet, spicy, sour and full of flavour with juicy ash gourds that are yum!